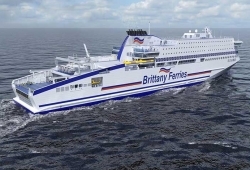 French shipping company Brittany Ferries has confirmed the construction of a US$230m LNG-electric cruise ferry to join its 10-ship fleet. The vessel, named Honfleur after the seaside destination on the Seine estuary in Normandy, will be built at the Flensburger Schiffbau shipyard in Germany and is set to enter into service in June 2019. It will operate along the Portsmouth (UK) to Caen (France) route alongside the company’s Mont St Michel on three daily return sailings. Normandie, the ferry it replaces, will move east to serve the Portsmouth to Le Havre route. 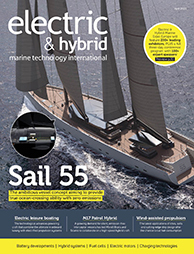 Powered by LNG, Honfleur’s four main engines will feed electric generators and two electric shaft propulsion motors with two fixed-pitch efficient propellers. The move to an LNG-electric propulsion setup follows a US$103m investment in sulphur- and particulate-reducing scrubber technology. Six Brittany Ferries ships have been retrospectively fitted with these exhaust emission systems over the last 18 months.